Authentic Personalised Tours in the Languedoc, France. A blog bringing news of recreational and educational tours structured around the area's extremely rich and varied history. Each tour focuses on the region's Cathar history but is threaded with delights of life in the Languedoc. 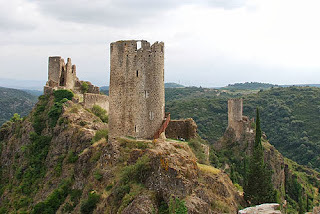 Lastours is the site of four separate fortifications, three of which date from Cathar times. There are also vestiges of an even older castrum. The site is a French Historical Monument. The include Cabaret, the effective headquarters of the resistance to the Crusaders for many years, as the Lords of Cabaret defied sieges and intimidation, and led a guerrilla campaign against the French invaders. The four semi-ruined castles spectacularly located on adjacent hills. They are well spaced, and the paths are rugged, so walking to all of them good footwear. Minerve was the seat of a powerful vassal of the Viscount of Carcassonne. Cathars took refuge here as Simon de Montfort’s army ravaged the Languedoc. Like many strongholds, Minerve was well defended by sheer cliffs on three sides. Eventually, crusaders took Minerve by destroying its water supply. 180 Cathars were burned alive in 1210. You will visit village, still occupied and the vestiges of the castle of the lords of Minerve. You will see the site of the well that was destroyed and the trebuchet that destroyed it, where the Cathars were burned according to local tradition, and Cathar memorials. Questions Somebody Asked Once QSAO. (c) Cathar Country - www.catharcountry.info. Simple theme. Theme images by luoman. Powered by Blogger.